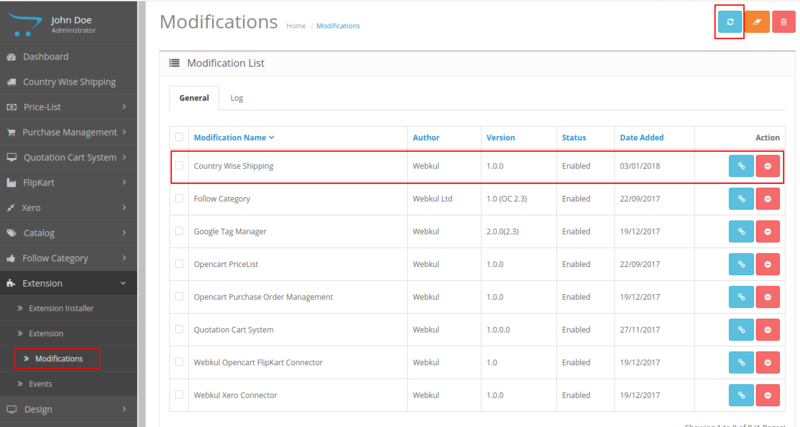 Opencart Country Wise Shipping module enables the admin to configure impact price on the shipping method according to a Country and their respective Zones. For this, the admin will set shipping prices as per the product weight for the respective countries. The buyer can view the variation in the shipping amount of the shipping method according to their delivery address. 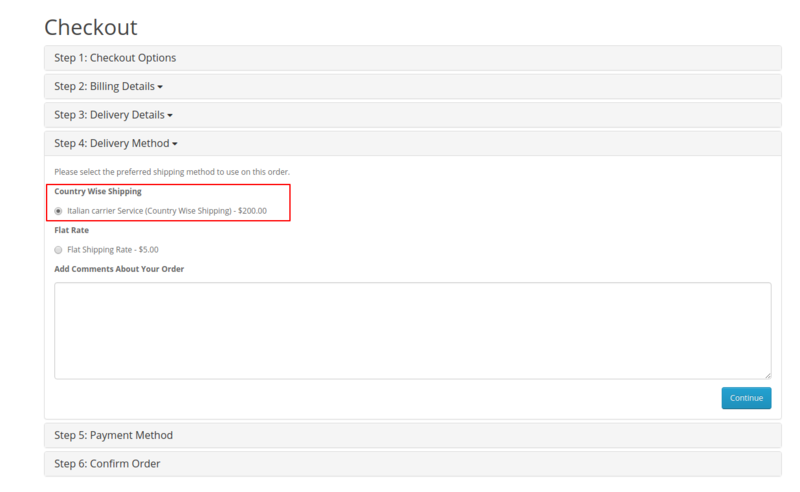 The admin can set shipping price for their shipping method. The admin can define Shipping rule for the products according to a country and their respective zone. The admin can set shipping amount as per the product weight range. The buyer can view the shipping price according to their delivery address and the product weight. Admin will get a zip folder and they have to extract the contents of this zip folder on their system. You need to transfer the admin & catalog folders into the Opencart root directory on the server as shown below. Now, you will navigate to Extension Installer and upload the file cwshipping.ocmod.xml which you will find inside the ocmod folder. Now navigate to ->Extensions->Modifications and click refresh on the top right-hand side as shown below. After the above step, the admin needs to navigate to System->Users->User Groups->Administrator(Click the edit button). Now, select all for “Access Permission” and “Modify Permission” and then tap the save button. 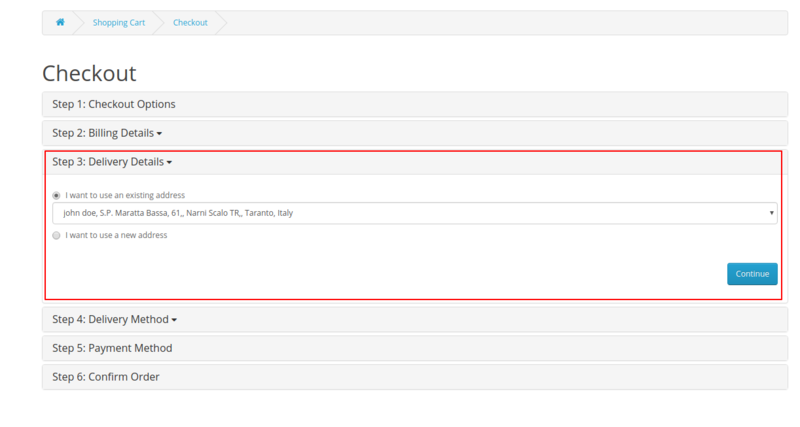 On clicking the edit button admin will land to Country wise shipping page as in the below screenshot. 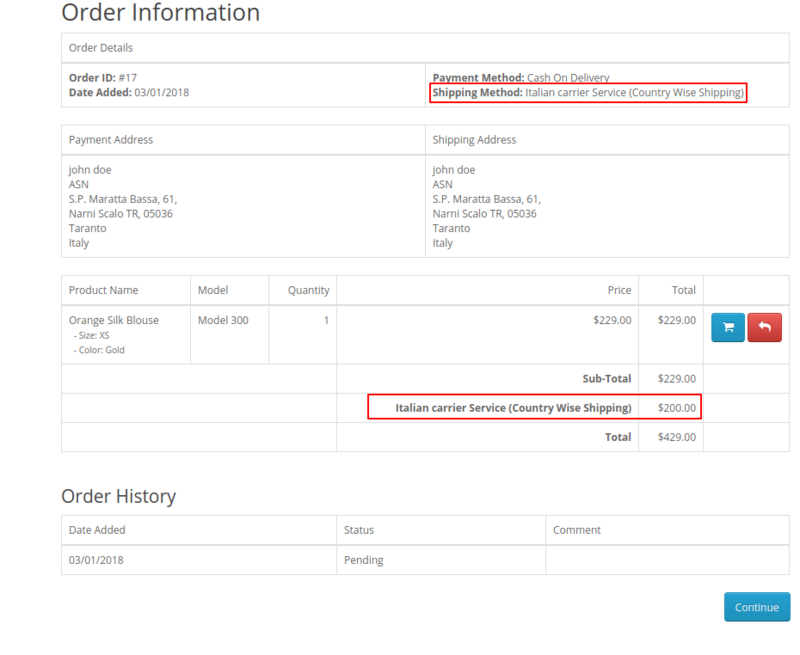 Status- In order to show the shipping method at the time of checkout, the method must be enabled. Title- This is the name of the method which will be shown at the time of checkout. Error Message- If the method is not available for the particular country. Apply Minimum Shipping Cost-If admin wishes to enable minimum cost if the shipping cost is not available for a country. Minimum Shipping Cost-This would be applicable if the above condition is Yes.If admin creates the rule and no cost is defined in that rule then this cost will be picked at the time of checkout. Weight Class- This is the weight class which will be considered when we create the shipping rule. Tax Class- This is the tax which applied to shipping amount for country wise shipping method. Sort Order-Order of selecting shipping method at the time of checkout. Here, the admin can enter the details of the shipping methods. Carrier Name- The name shown at the time of checkout for the shipping method. 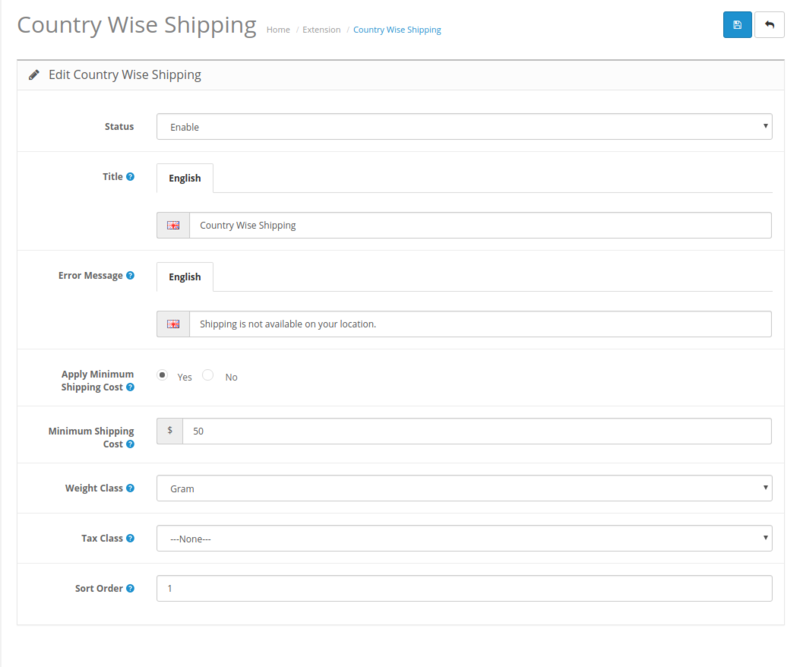 Select Country- Country Name for which we wish to enable the shipping rule. Zone- Zone of the country for which the rule is applicable. Weight range and Shipping Cost- Here admin can define the rule by stating the weight range of the order and their respective price charged for the same. The weight class here would be same as that mentioned in the admin configuration. Please Note– Here, in order to enter the zone you need to select the Country. The customer can see the shipping rule at the time of checkout the shipping rule is applicable to the delivery address of the customer. After providing the delivery address the customer can select the Shipping Method as Country Wise Shipping method. On Confirm Order, the customer can see the total amount of the product along with the Shipping amount added to it. 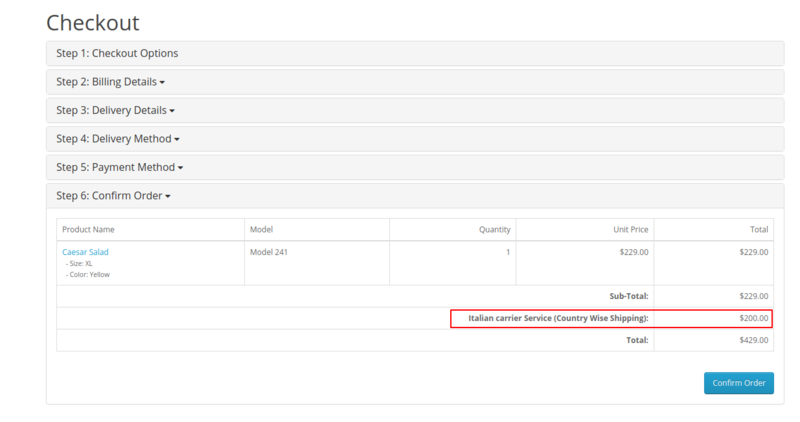 Italian carrier Service– This is the name of the carrier as given by admin while creating shipping rule. Country Wise Shipping– This name of Shipping method. The Customer can view the Shipping method of the order in Order History(My Account>Order History). That’s all for the Opencart Country Wise Shipping module, for any issues feel free to add a ticket and let us know your views to make the module better https://webkul.uvdesk.com/. Supported Framework Version - 2.0.x.x, 2.1.x.x, 2.2.x.x, 2.3.x.x, 3.x.x.x.